Fine weather and a 15 knot south-easterly breeze saw a fleet of 45 monohulls set sail this morning from Bramble Bay in the 64th running of the Brisbane to Gladstone yacht race. Nearing the halfway point in the 570km race, the leading yachts were Lahana, Black Jack and Wild Thing. All three were expected to arrive at Gladstone before 6 am on Saturday, well ahead of the race record of 20 hours, 40 minutes and 50 seconds set by Skandia in 2004. Shogun in fourth place was leading on corrected time. Also racing in a separate competition were nine multihulls (pictured). 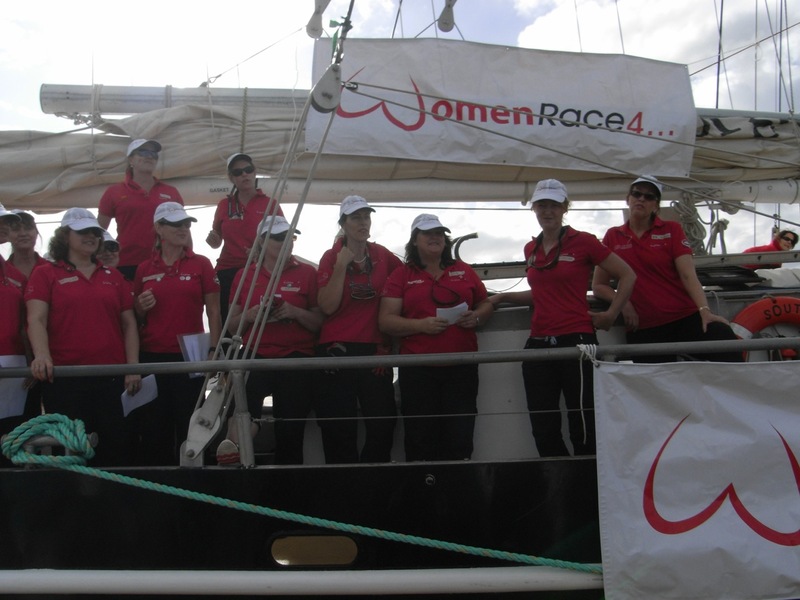 Queensland Cruising Yacht Club race director Mr Herb Prendergast said that, despite two late withdrawals, there had been “no hiccups” in the preparations for the race. The Bluewater Festival, held simultaneously in Lower Moora Park at Shorncliffe, swelled crowd numbers, the best vantage points being taken well before the 11am start. With a crew of four men and 26 mostly novice sailors from WomenRace 4, the double-masted schooner South Passage made an impressive sight as it pulled away from the dock to the cheers of well-wishers. 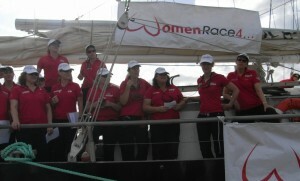 Watchleader Rosemary Miller said the WomenRace4 crew (pictured right) were helping to raise money for Redkite, a charity that assists families with members who have cancer. “We expect to finish about 3.30 Sunday morning,” she said. On board the 11 metre Sassy, built in Geelong in 1979, were skipper Philip Lazzarini, sailing in his 19th Brisbane-to-Gladstone, and crew member Glen Somerville, competing for the 23rd time. “It’s my 19th time, but I still get butterflies. But don’t tell the others that,” Mr Lazzarini said. Seeing her husband off at the jetty was Karen Somerville, official timekeeper for the start of the race. A gun fires and a flag is flown at five minutes, four minutes and one minute beforehand and again at the start, she said.